Quentin from Ottawa, Ontario, sent us a note and pictures of the Newgren lift that he has rescued. After wandering through the Farm Jeep site, he had questions about bringing the lift back to life Quentin’s lift is missing key components, leaving him with the basic frame. While trying to respond to his questions, we thought it might be worthwhile to write a piece on what we have learned since we started our restoration over a decade ago. The story of the Newgren lift begins and ends in just a couple of years. The Newgren Company began selling a version of the Love Lift in 1946 and stopped production of the its own designed lift sometime after 1948 when it was purchased by Monroe Automotive Equipment Company. The Newgren’s simple design has allowed owners to keep the lift working even when key components had to be replaced. Our focus has been to keep our lift as original as possible. We were extremely lucky that our lift came with everything except the pump. 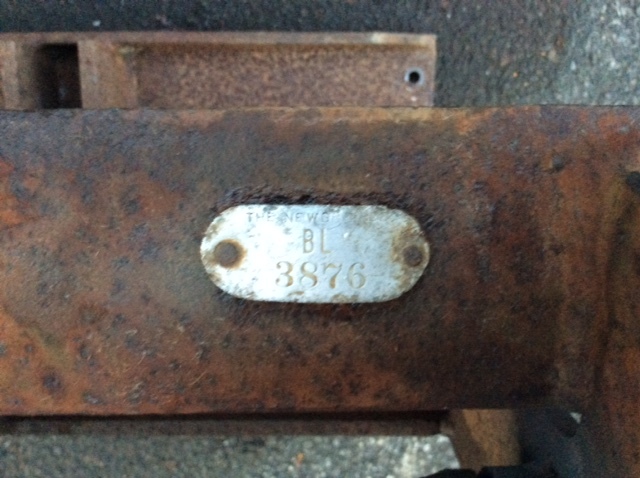 Later, we were able to find an original pump and bracket. But between the time we found the the lift and installed the original style pump, we experimented with a number of alternative pump configurations. This is not a how-to post, rather a more of a don’t-do-what-we-did warning. We also don’t have complete information on how to replace all the components. But hopefully, we can point Quentin and others in the right direction. The Newgren system uses a single-action cylinder. That means hydraulic fluid under high pressure is used to extend the cylinder and raise the implement and the weight of the implement retracts the cylinder to lower it. A control valve is used to direct the fluid for the required action. To raise the implement, the valve must direct the fluid to the upper (or top) chamber of the cylinder. 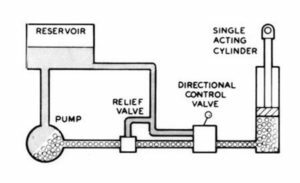 To maintain the position of the implement, the value must shut off flow to the cylinder and dump the fluid being pumped under pressure into the reservoir. To lower the implement, the valve must open the upper chamber and allow the fluid to empty into the reservoir. When we started, we didn’t have this basic understanding and it caused us to make a number of mistakes. For example, a single action cylinder requires a “port” to allow air to move in and of the lower chamber. In most applications, having the air port open to the environment isn’t a problem. But with the Newgren setup, the port is right down in the dirt and dust. The designers wisely used the extra space in the reservoir, as an “air tank” by attaching a hose from the lower cylinder port to the top of the reservoir. We overfilled the reservoir, not understanding the need for the air space, and it resulted in a pressurized system. 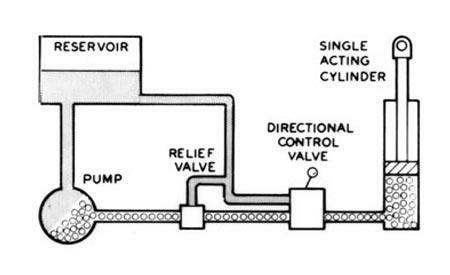 Adding to our problem was the lack of a relief valve as shown in the diagram. The end result was blown seals in the pump and damage to the cylinder seals. The first piece of the puzzle is to find a single action cylinder that will fit in the frame and has the appropriate bore and stroke. The bore (the diameter of the cylinder in which the piston travels) will determine the speed and power of the lift. The stroke is the distance from a fully closed to a fully extended cylinder. Newgren used at least two different styles of cylinders. Our cylinder body was rusted and had to be replaced. In the process of rebuilding the cylinder the stroke was shortened, mostly like when the rod was replaced. The end result is that we don’t have the full range of lift. The Newgren lift uses a large metal “push” block to move the implement up and down. The critical measurement for the cylinder is the stroke length. The cylinder must be able to push the block and attached short arms through the complete lift arc. We believe our cylinder to be a 3″ bore with a 6″ stroke. At this point, we would have hoped to have had a recommendation for a modern day replacement. We don’t. We are sure that one exists and we will try get recommendations from others. When we have information we will update this post. 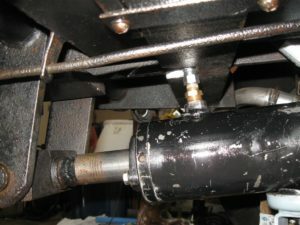 But for starters, you will need a cylinder with a base mount that will fit the Newgren frame and no rod mount. The rod rides in the lift block and will require a stop or collar to engage the block. The Love lift and the Newgren lift had a control handle next to the drivers seat. This was possible because the hydraulic control valve is located on the front of the reservoir. It uses a spring-loaded push/pull rod to raise and lower the implement. Releasing the handle returns the valve to the neutral position. Our control valve doesn’t seal properly and allows the cylinder to leak down. The Newgren valve doesn’t have O-rings or other seals that can be replaced. We attempted to find a modern control valve to replace the original but haven’t been able to do so. An alternative might be to mount a control valve between the seats. You would loose the ability to control the lift from the rear of the jeep, a unique and handy feature, but could maintain the between the seats control. Another alternative would be to adapt the Monroe solution of having the reservoir and the control valve mounted between the seats. In a case, like Quentin’s, were you don’t have a reserve tank in place, this might be a good alternative. We are looking for someone to duplicate the Newgren control valve with provisions for O-rings, Again, if we find a source or have a duplicate made we will update this post. The original Newgren reservoir fits neatly inside the frame. It has a fitting on top for the air “bleeder” hose described above and the mount for the control valve. Most importantly it is sized to hold the proper amount of fluid and an air pocket for the cylinder. There is no easy way to fill the reservoir (you use the small pipe at the rear of the jeep) and no way to measure the fluid level. The Newgren reservoir measures roughly 8.5″W x 10.5″L x 4.5″H and is held in the frame by a metal strap. Instructions say to fill the reservoir with 5 quarts of oil. While we are not aware of any ready-made tanks of this size, one could be fabricated. However, the reservoir does not need to be locate in the frame. Other solutions are available. We have tried a number of different style pumps – crank driven, belt driven and electric. The Newgren lift pump (and the Monroe lift too) used a pump mounted on the front of the crank pulley. The pump was/is the same pump used on International Harvester series “A” and series “C” tractors. It has a flow rate of around 4 GPM. 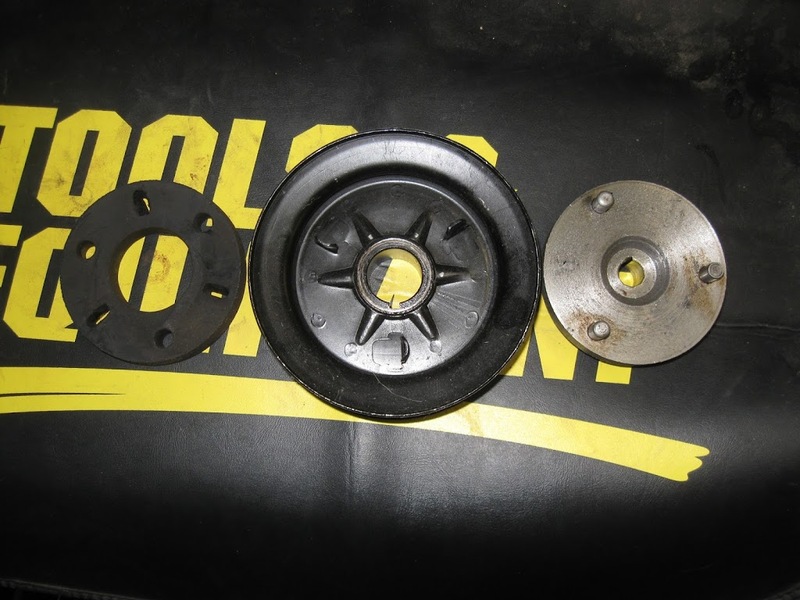 These pumps are still available from IH/Case parts suppliers, but are very expensive. This is the pump we currently have installed. 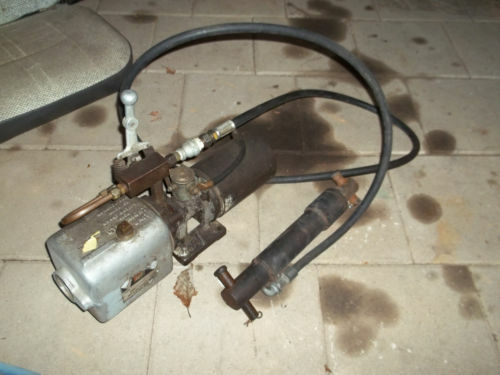 The HY-LO-Jeep pump was commonly used for snow plows and they are still available. This is combination pump/reservoir/control valve. The control valve is operated via a rod that fits through the firewall and a mounting bracket under the dash. For applications like Quentin’s, this would be a simple solution. You would not have between-the-seats control or at the back of the lift, but otherwise a very good alternative to the crank pump . There is a version of the HY-LO-Jack that is a pump only (no reservoir or valve). We own one of these but failed to get it to work properly, most likely because it was worn out. And once these gear type pumps are worn out, they cannot be rebuilt. You need to be very cautious of buying used gear type pumps that have lots of hours on them. A clear advantage of using an electric pump is that it only runs when needed. Our CJ2a had been converted to 12 volts when we found it. Since we were having problems with the HY-LO pumps, we decided to purchased a 12 volt pump off ebay. The first had its own reservoir and this setup did not work well. Unencumbered by the thought process, we simple hooked the two reservoirs together. Rather than try to explain or analyze why this was a bad idea, we will do what we did back then and move to a pump without a reservoir. 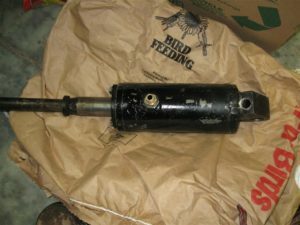 This second pump, which had been used on a truck lift-gate did work well and served us until we acquired the crankshaft pump and bracket. At the time when we were searching for an electric pump, there were few options within our budget. A check of ebay today shows many pumps available. Included in the list at the time of this posting was a 12 volt version of the Monarch HY-LO pump. We have seen pictures of Newgren lifts using 6 volt versions of this pump. They were mounted between the driver’s seat. Unfortunately, 6 volt pumps are hard to find and if you want to keep the stock electrical system, this may not be an alternative. Our initial goal had been to have a working lift. But then as we learned more about the Newgren history and built a second jeep, the goal changed to having a lift that was as original as possible. Our lift is more show than go. So what would we do if we were just looking for a working lift, as Quentin is doing? Since he is missing so many components, we would find a cylinder and use a HY-LO belt-driven pump. That pump would provide three of the four missing components. It has been used by many Newgren owners and can still be found in good shape. This is the arrangement that John Ittel run’s on one of his 3Bs and says it works well. John has a number of Newgren lifts among his collection of farm jeeps and we would take this as a good recommendation. 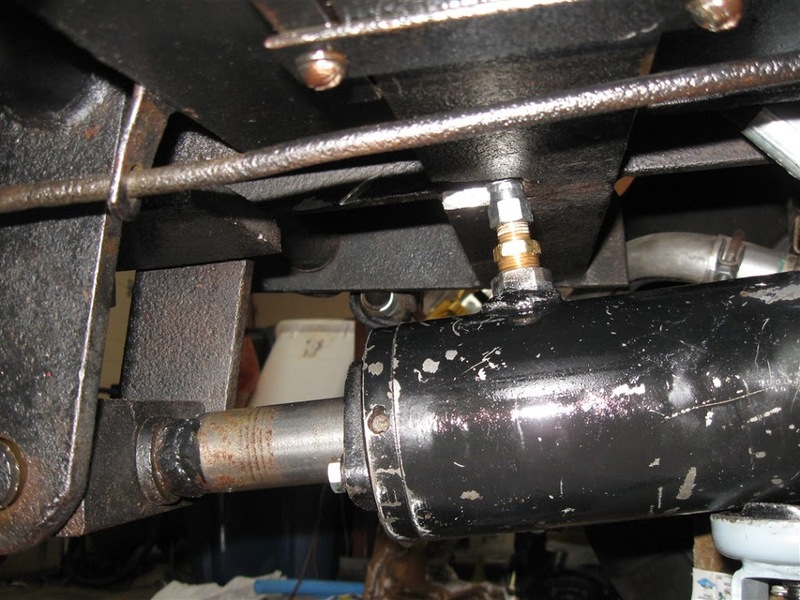 We would carry the frame to a good hydraulic shop and have them find an appropriate cylinder. One of the joys of the Newgren design is that the frame stripped of its components is easy to haul around. If the jeep will have a 12 volt system, then an electric pump with reservoir and a control valve between the seats would be a good working option. We like the option of the pump being active only when needed. Given our experience we would not recommend duplicating the Newgren reservoir and control valve. The reservoir is difficult to fill and there is no way to determine the fluid level. It should be possible to modify the design to overcome these issues. If so, coupled with a modern control valve it could allow between the seats operation. If you want a crank driven pump, you can purchase the IH/Case pump. Newgren used two types of brackets. The first was a simple strap metal design that could easily duplicated. You would need to use the Monroe style coupler to mate the pump to the crankshaft. The “special” crankshaft and pump adapter used on the early Newgren offer no special advantages. 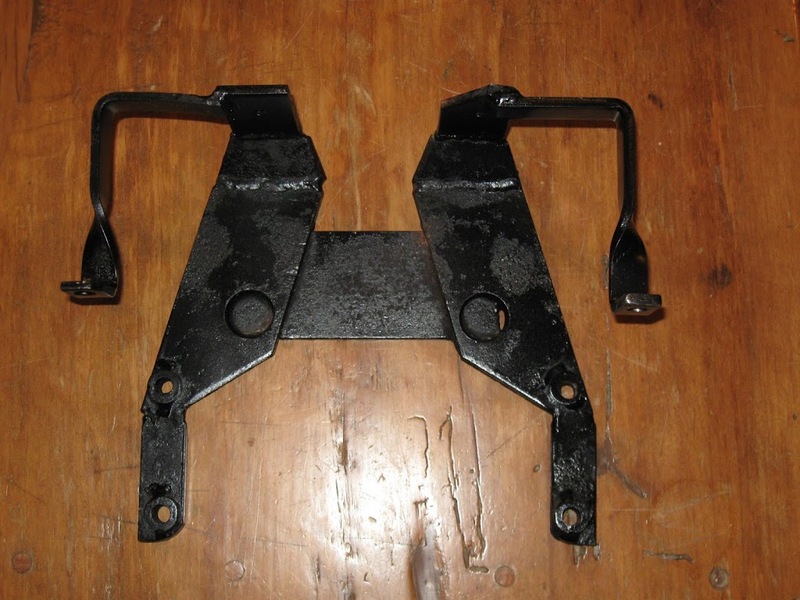 It may difficult to find the Monroe style, but it is much improved design and uses the standard Willys pulley. We would again look at a simpler pump solution, either electric or belt-driven. Whatever your pump choice, make sure that there is a pressure relief valve in the system. A lack of one, coupled with are lack of knowledge cost us two pumps. As we stated at the beginning, this post is not a how-to, but a way to share some of our lessons-learned and idea of what we may have done based on hindsight. We welcome comments and corrections. Can you please send me some info on the 12v pump that was hooked up to the Hy-Lo Monarch pump in your The Things We Have Learned on the Newgren Lifts (11/2017) post? I'd love to see how it mounts to the Hy-Lo pump/ part number etc. if possible and thank you for the post. We don't have a parts list. However, Monarch is still in business. Might be worth contacting them to see if they might have a parts list or original diagrams or plans. Electric versions of the Hy-Lo pump occasionally appear on E-bay. Good luck. Previous PostPrevious Love is everywhere…. Next PostNext A Bantam Plow Saved From the Scrap Pile!